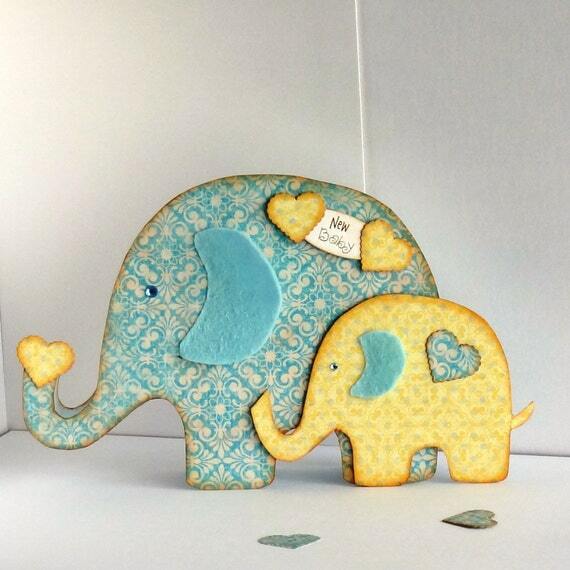 Here's a cute elephant shaped card to welcome a new baby into the world. This one is in Pale Blue & Lemon and features hand cut elephants decorated with designer papers from HOTP 'Soft Nostalgia' collection, which have a lovely vintage look to them. The baby elephant has been 3D dimensionally attached to his mummy and is sure to look great on the mantlepiece and as a keepsake. All paper edges have been hand inked with Tim Holtz Distress Inks in 'Tea Dye' colour. The elephants also feature hand cut ears made from blue felt and pale blue faux gem eyes. punched hearts and a New Baby sentiment provide the finishing touches.